Children’s author Dheera Kitchlu has just finished writing from A to Z. Her latest series of six books to familiarise the pre-primary child with phonetic sounds is written and illustrated by her. Amusing characters and creatures representing each letter of the alphabet have been created and woven into humorous everyday stories highlighting the phonetic sounds along with charming visuals to entice the little reader. IT’S not always the big picture that holds the attention. For some people, the very minute details make a huge difference. Inderjit Kaur, a social activist and principal of a school at Kapurthala, has her eyes and ears primed for problems of senior citizens and slum children, and sometimes, these problems present themselves as a series of seemingly inconsequential details. JUST back from a tour of Singapore and Cambodia, Ramdas and Aparna Padhye are full of wonderful stories about their specially created puppets. "Channel 12 of Singapore commissioned us to design a hundred puppets to create a serial anchored by a puppet called Smile. This is aimed at pre-school children in that country. — Yeppies aim for altogether loftier heights. Fun with Alphabet Stories says Dheera, "is a way of respecting children because we still do not allow them to have fun while learning." Dheera believes she was a "late bloomer"! She started out by creating stories with a puppet called Sheru, to teach her young daughter Indian traditions and culture when she asked just how many pennies she owed her mother? This and a lifelong ‘skirmish’ with a reading disability, has led her to write for little children full time. Her creative abilities were put to the test as a teacher for tiny-tots in a nursery in Mumbai where she moved after her marriage. "As a child I had problems writing, spelling and most of all reading aloud. My teachers were rough and treated me like an idiot. When I saw a child struggling with words I could empathise with what the little one was going through." The revelation came in 1987. Almost six years into teaching tiny-tots at the Sophia Nursery, Dheera decided to do an Early Childhood Care and Education (ECCE) programme at the Sophia Polytechnic to qualify as a teacher. One of the papers dealt with learning disabilities. "I was mesmerised. To discover that I was dyslexic gave me great heart. I also knew I could conquer it now and help other little children combat their uncertainties." A chance to become the Acting Principal of the nursery enabled her to put together everything she had learnt through her modules with her own motley experiences. "We tried out many new teaching methods and experiments and it was a very fruitful year. We changed the curriculum and laid stress on the weaker children being brought to the fore." The changes were felt directly by the children. Dheera recounts how one little preschooler told her to stop telling them stories and start teaching them otherwise they would not get into Big School! "I considered it to be the biggest compliment I could get," laughs Dheera. Also at this time, her children needed poems, stories, plays for their school, for elocution, dramatics workshops and for inter-house competitions. 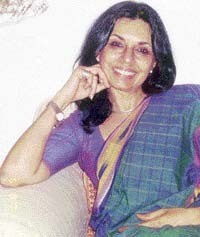 Dheera started to write for them and this led to Radio plays, in-flight entertainment programs for young children and finally to writing for a soap on television, Saara Jahan Hamara about children and adoption. The soap wound down, but the concept fuelled Dheera’s imagination and she wrote and illustrated Your Story in 1994, a picture book read aloud (for three year olds and over) to help parents explain the concept of adoption to the child that they have taken on. The book today is given to all parents when they come to adopt children at centres in Mumbai. A bundle of books followed. My Friend Sadhu Shiva (Fingerprint Publications) in 2001, Granny’s Greek Tales (Rupa Publications) in 2002, and in 2003, The National Association for the Blind (NAB) in Mumbai, commissioned Dheera to write a book on the spirit of blind women. Darkness to Light: Stories of Uncommon Courage by Blind Women Achievers was born. This association has been a long and prolific one as Dheera continues to work with NAB on their various projects converting children’s stories into Braille and into cassettes to enable blind children to access literature. "Most children’s books are sourced from abroad, it is only recently, in the last three or four years, that people are writing for young ones. Instead of Enid Blyton’s flaxen-haired Amelia Jane I wanted children to be able to read about characters which they can identify with," says Dheera, 36. Writing for children is where her passion lies and she spends her day reading, researching and scribbling. She has great expectations from Fun with Alphabet Stories for it has been the "most fulfilling work" she believes she has ever done, especially since the vocabulary has been researched and found to be appropriate for the pre-primary child. So here is where we get to meet Vithal the Viper who lives in a garden of violets or Andy the ant-eater who does not eat ants but only apples. Inderjit Kaur (under the aegis of Shri Guru Granth Sahib Aasra Trust) runs an old age home, a charity school for underprivileged children and a vocational centre for economically deprived women at Kapurthala. Already, more than 200 children from slum areas and shanties are the students of the charity school that runs during late noon at MGN School building in Kapurthala. Some of these students have even been integrated into mainstream schools. "The seeds of this school and old age home were sown two decades ago when I was a teacher at a school in Delhi. Later, when I joined MGN School here, my dream revisited me. I knew it was now or never. Initially, some thought that my enthusiasm was misplaced. But I persisted in my endeavour," she says, her eyes lighting up. "Help came in from various quarters, including the MGN Management, teachers, NRIs and philanthropists who pitched in with their bit." Ever since she started the old age home, she has gained a new perspective on insensitivity and callousness of "significant others". "It’s sad that we neglect the aged. Generation gap or clashes of opinions — these just don’t have any relevance in a scenario that violates horrendously the basic rights of the elders. What is glaring is the lack of both healthcare provisions and emotional support to those well past their seventies and eighties," says this educationist, who also dabbles in poetry writing. She adds that even in a relatively conservative and tradition-bound city like Kapurthala, ill treatment of the aged is common. "Thrice a month I, along with other trust members, visit senior citizens at their homes. We keep a tab on their medical condition and their diet. Many of them have almost been abandoned, though their children, fearing social stigma, are reluctant to ask them to stay at an old age home. The elders who are amnesic or whose mental faculties have diminished over time are maltreated the most," she says, a tinge of regret perceptible in her voice. But, as one of the inmates of the old age home tells us, hope shines through the old people’s lives when well-meaning individuals like Inderjit Kaur work tirelessly to brighten up the days of the aged! JUST back from a tour of Singapore and Cambodia, Ramdas and Aparna Padhye are full of wonderful stories about their specially created puppets. "Channel 12 of Singapore commissioned us to design a hundred puppets to create a serial anchored by a puppet called Smile. This is aimed at pre-school children in that country. Singapore being multi lingual, this serial will be presented in four languages – English, Chinese, Tamil and Malay. The serial carries several social messages about secularism, environment, values in life, the importance of education, family relationships and how to conduct them, the place of money in one’s life and so on. The puppets for this show were made in Mumbai and we carried them to Singapore for the filming. We have also completed a programme based on puppets for Cambodian Television. This is aimed at children under the age of eight years. The puppets here tell stories of animals as related to human beings and spread the message of kindness to all living beings. "However, the best project we have done in recent times is for Disney Channel in India, where puppets do a cookery show for children. The standards of the Disney Channel are very stringent. Every puppet has to be standardised and has to meet their specifications. So we had a tough time making the puppets of characters they have designed; but finally, we succeeded. In this cute cookery show, the fridge, the mixer, the cooker, the oven and all other kitchen appliances are talking puppets and conduct conversations with the anchor puppet called Mitzy, who spells out the recipe for the viewers. Mitzy teaches children how to make simple food and spreads the message of nutritional food and good health among children." From the way Ramdas and Aparna describe their assignments, it seems that the world over, puppets are mainly used to entertain or educate children. Social and cultural messages and awareness of environment are the chief aims of the programmes commissioned by worldwide television channels. But has this tool been used in India? 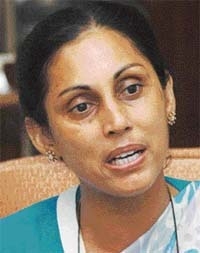 "Unfortunately, Indian television has not been able to build a successful children’s TV channel. The best we have done until now is a serial called Misha for Alpha TV. The money available for children’s programmes in India is pathetic and the production values are dismal. Children in India seem to watch Bollywood movies and star-based programmes from a very young age. This is not so in other countries. They have their own programmes, which achieve high TRPs. "However, in India, we have used puppets for ads, music videos, films and live shows for Bollywood films. The Lijjat papad ad immortalized a puppet. So did Falguni Pathak’s video ‘Maine Payal Hai Jhanakayee’. 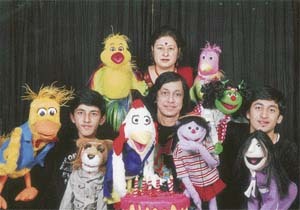 Our puppets were used in many films in Hindi, Marathi, Telugu and Tamil. We have done shows for Doordarshan and other television channels but rarely used puppets to create a value system for Indian children." Ramdas Padhye has come a long way since he began working with puppets and ventriloquism in India 38 years ago. "I was born in a family with a background of puppetry though I am a mechanical engineer by training," he says. His father – Prof. Y.K. Padhye –was the pioneer of this art and he worked throughout his life to preserve this heritage of India. He learnt ventriloquism from him and began to give shows during my teens. By the time I was 23, I performed before Prime Minister Indira Gandhi and created thoroughly Indian puppets on her advice. She encouraged me to use puppets for spreading messages of family planning, small savings, basic education and the grow-more-food campaign. She also encouraged the use of puppet shows to entertain the sick in hospitals and mentally challenged people in institutions." Ramdas’ fame spread wide and soon he was invited to the represent India at the International Ventriloquists Convention, 1992 in the U.S. This is the first time such an invitation was offered to an Indian ventriloquist. "I then set up the Ramdas Padhye Foundation as a charitable trust and devoted my time to the propagation of art of puppetry and ventriloquism. Today, we offer workshops to those interested in the art. We teach puppet making as a means of livelihood to those interested. We experiment with modern techniques and developments from around the world. I have written books on the subject of ventriloquism and puppetry. Aparna is a professional singer and works with me. My son Satyajit is going to join us soon. We have a workshop to make puppets in central Mumbai and a larger one in the suburbs, where large puppets are made. Puppets can create humorous situations very easily. I have made puppets of President Bush and President Clinton and used them in my shows. So this is one more side of entertainment where puppets can feature." Looking at the vast variety of work done by these pioneers, it is easy to see how puppets and ventriloquism can be used for different purposes in modern society. It can enhance branding of products; it can add an edgy touch to films and videos; it can be used for social message spreading (such as eradication of polio in India); it can be used to create children’s programmes; it can be used to create political satires and finally, it can conserve a folk theatre tradition, which has been India’s heritage for centuries. "We are looking to making water and air puppets soon," says Ramdas, "Water and the sky will be used as the backgrounds for our puppets instead of the regular stage. We plan to encourage environmental education in this manner. With some luck, we shall go forward and achieve international success." A report has identified a new breed of ambitious twenty-something, dubbed the "Young, Experimenting Perfection Seeker". Whereas Yuppies had rather prosaic, old-fashioned aspirations— lots of money, a big house and an impressive job title—Yeppies aim for altogether loftier heights. They want a job that will bring them everlasting fulfillment. So instead of knuckling down to one profession, they spend their twenties "browsing" through various careers in search of The One. This agony of indecision extends to other areas of their lives, such as where to live and who to love. They "try on" a series of relationships, deferring marriage and babies for as long as possible, and often live with their parents into their late twenties rather than commit to the tyranny of a mortgage. "Yeppies are unsure how to achieve their ambitions," says anthropologist Kate Fox, the author of the report, "so they experiment through a shopping-style approach, trying to find the perfect job, the ideal relationship and the most fulfilling lifestyle. "They may be, as Fox claims, "less single-mindedly materialistic than their predecessors", but their style is every bit as consumerist. The idea that we ought to be fulfilled by our jobs is comparatively new, and thoroughly unhelpful. For most of human history, work has simply been a necessity. The Dickensian clerk, scratching away at the same ledger in the same office for his entire working life, may have been bored to tears—but at least he was not tormented by grandiose expectations. To pursue any kind of creative vocation, you had to be either privately wealthy or content to be poor. John Ruskin summed up the modest hopes of the 19th century worker thus: "In order that people may be happy in their work, these three things are needed: They must be fit for it: They must not do too much of it: And they must have a sense of success in it." Wise words indeed—but much too humble for modern tastes. These days, we expect to actively enjoy our work, and feel that we have failed if enjoyment is not forthcoming. Ever since the 1960s, we have had it drummed into us that we are entitled—even obliged —to seek personal fulfillment in every aspect of our lives. And since capitalism has done away with the job for life, most of us no longer have the option of just stumbling into an office and staying there. Nobody talks about their careers any more - they’re too busy trying to sort out marriage and babies. A cheerful resignation has settled over the bankers and marketers: like the Dickensian clerk, they are coming to see work as a means to an end, rather than their only vehicle for self-expression.